May 2, 2017 – The International Society of Hospitality Consultants (ISHC) and Burba Hotel Network (BHN) recently presented Marlen Mena, Rooms Division Manager of AMResorts’ Dreams La Romana, with the Rising Star Award at the 2017 Caribbean Hotel & Resort Investment Summit (CHRIS). In its seventh year, the Rising Star Award celebrates the excellence of emerging leaders 35 years of age and under in the Caribbean hospitality industry. 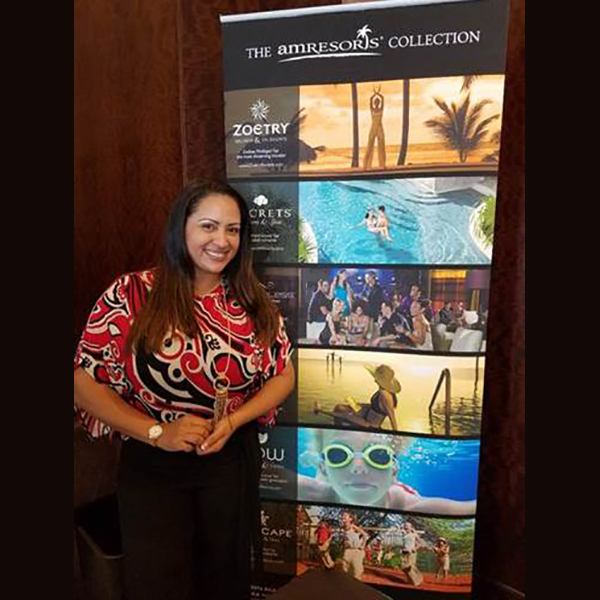 Marlen Mena began her career at Dreams La Romana Resort & Spa as Preferred Club Manager and later served as Reception Manager and Operations Assistant prior to her current role. The AMResorts Collection of brands plans to further expand its portfolio to more than 60 resorts in nearly 30 destinations with more than 23,000 rooms throughout Mexico, the Caribbean and Central America by the end of 2020. For more information on the AMResorts brand and its properties, or to book a stay, visit www.amresorts.com. AMResorts, a subsidiary of Apple Leisure Group, is the fast-growing provider of sales, marketing and brand management services to six individually unique resort brands. The award-winning company continuously raises the all-inclusive concept to a new level of luxury with its signature Endless Privileges®, Unlimited-Luxury® andUnlimited-Fun® programs. Located throughout Mexico, Jamaica, Curacao, Dominican Republic, Costa Rica, and Panama, AMResorts’ more than 50 award-winning properties treat every guest to premium accommodations, desirable locations and extraordinary inclusions. The brands in the collection include: boutique Zoëtry® Wellness & Spa Resorts (www.zoetryresorts.com; 1-888-4-ZOËTRY); adults-only Secrets® Resorts & Spas (www.secretsresorts.com; 1-866-GO SECRETS); high-energy Breathless® Resorts & Spas (www.breathlessresorts.com; 1-855-65-BREATHE); family-friendly Dreams® Resorts & Spas (www.dreamsresorts.com; 1-866-2-DREAMS); vibrant Now® Resorts & Spas (www.nowresorts.com; 1-877-NOW-9953) and fun-filled Sunscape® Resorts & Spas (www.sunscaperesorts.com; 1-866-SUNSCAPE). Images, logos and informational material about the AMResorts Collection of brands and properties are available at www.amresorts.com/mediasite/media.